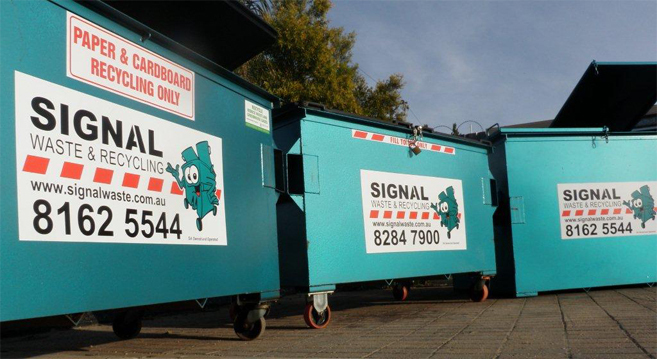 Signal Waste & Recycling are a South Australian owned and operated waste management company who are committed to helping reduce the amount of waste that ends up as landfill. Since 1989, Signal Waste & Recycling have grown into a successful waste management business that is constantly reviewing and applying world best practices and innovations. South Australia has a unique program in place to deal with waste management, which is an ongoing environmental issue that the Government of South Australia takes very seriously. The government has implemented a Zero Waste SA initiative that plans to “reduce waste to landfill by 35% by 2020”. Through education, advocacy and financial grants, the Zero Waste SA strategy hopes to fulfil its target. Homes, workplaces and councils are all involved in the Zero Waste SA campaign, all with the intention of reducing landfill and the devastating impact it is having on the environment. Signal Waste & Recycling are proud to be associated with Zero Waste SA and work closely with the association to constantly monitor their ongoing performance. Industrial Waste Management is also a specialty of Signal Waste & Recycling. This area of waste removal requires a specialised and experienced service due to the potential large volumes of waste and also the contents. Signal Waste & Recycling provides companies with ongoing waste removal services as well as specialty services such as confidential document destruction, cardboard recycling and paper shredding. Talk to Signal Waste & Recycling today to discuss your company's waste removal requirements. Where there is a need for an ongoing waste management and recycling solution. Signal can arrange a complete rubbish removal and recycling solution that is tailor made to suit your individual company's requirements. Our services include front lift compaction bins, waste bins, rubbish bins, recycling bins, confidential paper bins, walk in roll on roll off bins, wheelie bins, onsite compactors, tippler bins recycling containers. All of our commercial products are individually labelled and colour coded with easy to read and understand signage. We encourage waste minimisation and recycling programs to suit your individual needs. Signal supports the South Australian’s strategic plan of reducing waste to landfill by 25% within 10 years. Click here to learn more about our Landfill Diversion Program. For additional services please check out our Specialty Services page. Call our office today on 8162 5544 to arrange a free onsite waste and recycling audit.